Small business owners love what they do. From being their own boss to having total control over their schedule, there are certainly many perks to running a business. But what is it really like to be a small business owner? 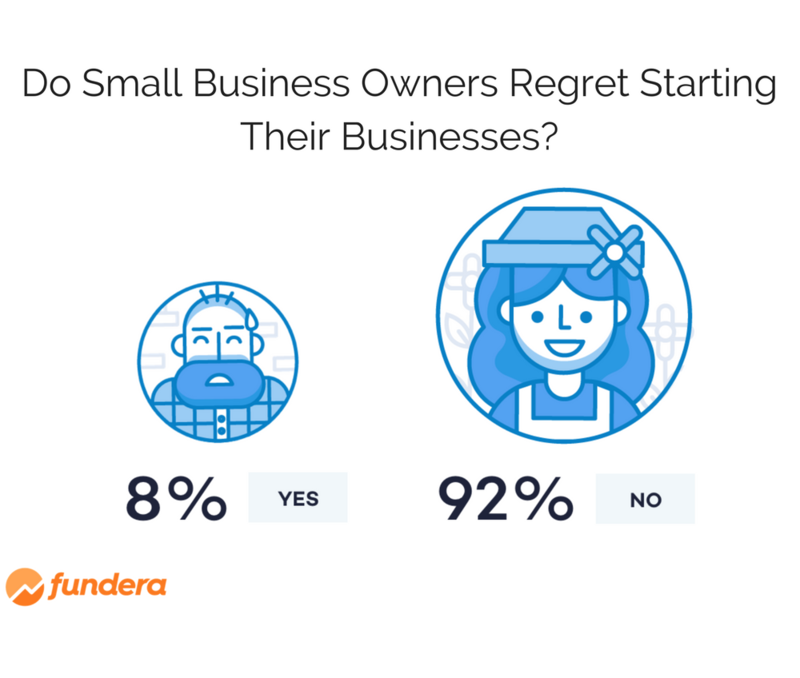 This summer, Fundera surveyed hundreds of American business owners to find out. Surprisingly, the results lean away from the most common assumptions. While little-to-no business owners regret starting their own businesses, our results reveal they work a lot harder and earn a lot less than the national average. Many people assume that “being the boss” means a flexible schedule and the ability to, say, work from the beach whenever you want. Unfortunately, it’s not entirely the case. While business owners do have flexibility, they also have two bosses—their customers and their employees. The buck literally stops with them, so they must work exceptionally hard to keep up. 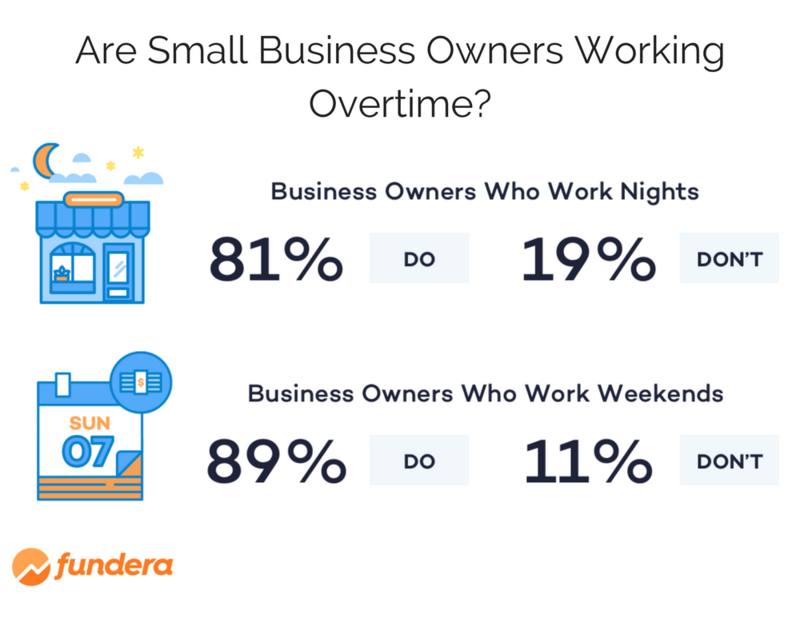 Most business owners work much harder than the average worker, with over 81% of respondents working nights and 45% working nights quite frequently. Even more, over 89% work weekends and 57% of those frequently work weekends. 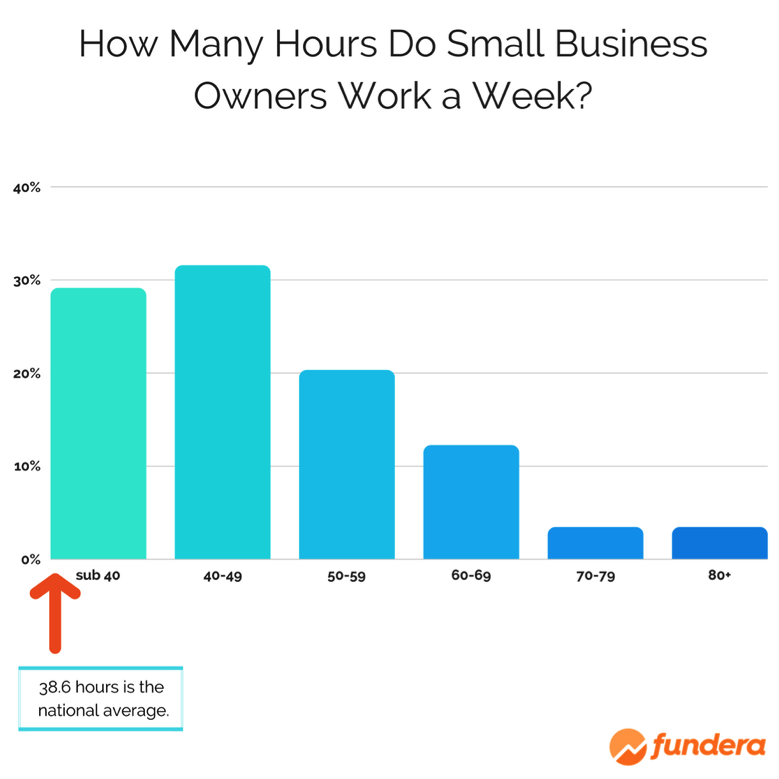 Additionally, more than 70% of the small business owners said they work more than 40 hours a week, with 19% working more than 60 hours a week, well-over the the national average of 38.6 hours worked per week. Academia is often placed on an opposite playing field than entrepreneurial ambition, and that mindset can materialize in concrete ways. The Thiel Fellowship, for instance, offers $100,000 to aspiring entrepreneurs to drop out of college and pursue their business ideas. 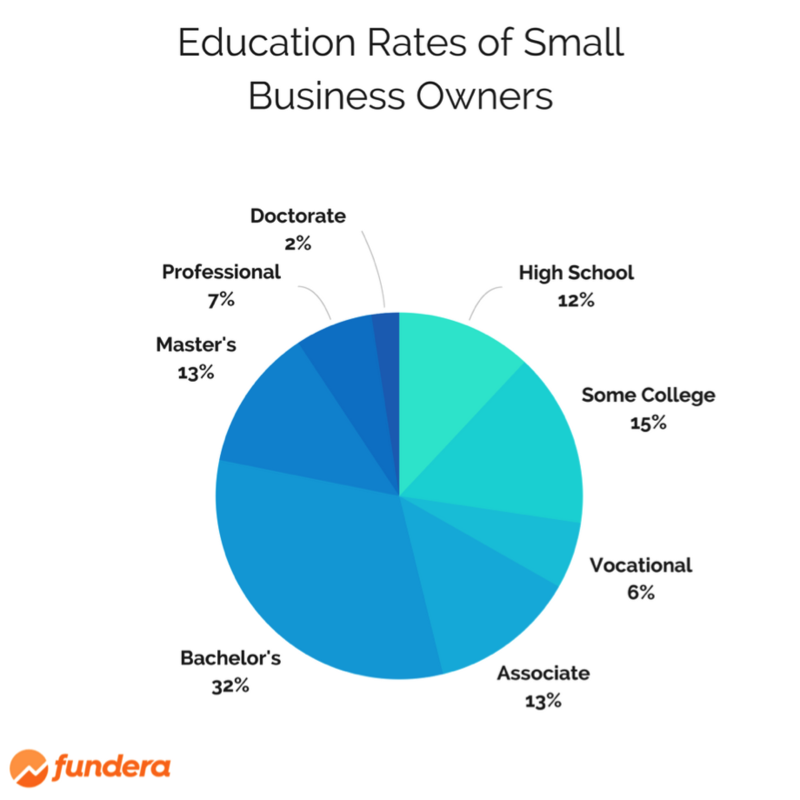 While some may think people can or should start businesses and forego the traditional university route, 53.78% of respondents actually have a bachelor’s degree or higher and only 11.98% end their formal education after high school. That’s compared to the national average of 33% of the population that has a bachelor’s degree or higher and 41.1% of the population ending formal education after high school. How Much Does Being the Boss Make You? Business owners work harder and are better-educated than the average population, but are they getting paid for it? While business owners are certainly getting rewarded in many other ways, they don’t make near as much (or anything at all) when compared to traditional CEOs. 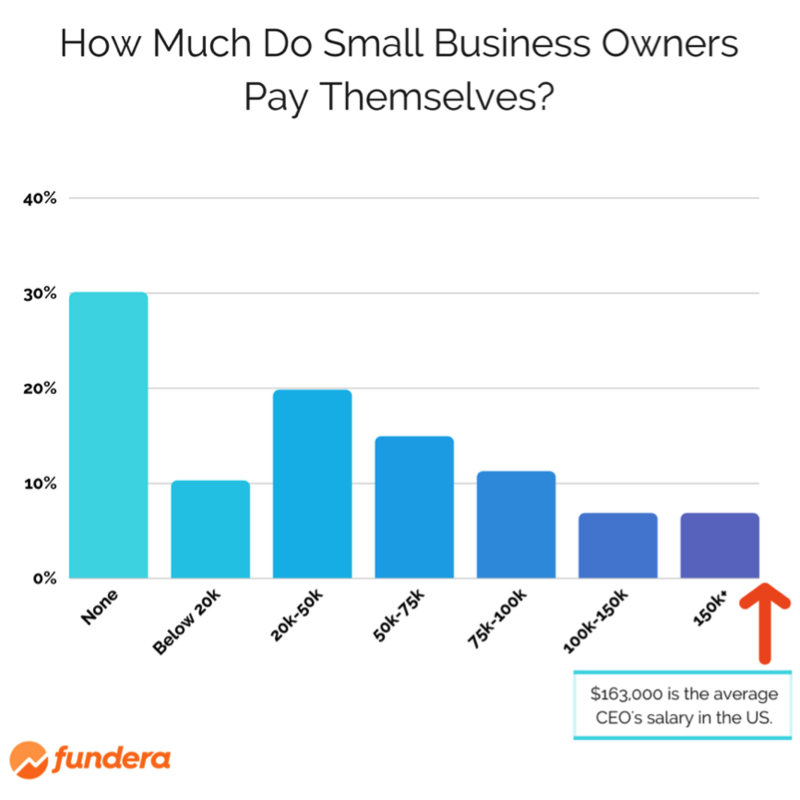 86.3% of small business owners said they take a yearly salary of less than $100k. Even more surprising, a whopping 30.07% don’t even take a salary. Meanwhile, according to Payscale, the national average salary for CEO’s rounds in around $163,000. Even beyond comparing small business owners’ salary to your typical CEO’s salary, the average hourly wage in the U.S., when calculated at 40 hours a week, far surpasses what most of our respondents pay themselves every year. Your average wage worker made $26.62 an hour in July 2017, and that rate at 40 hours a week ends up being $54,829 a year in earnings. These average yearly earnings are more than at least 60.7% of small business owners pay themselves. And, that’s not even controlling for their seniority and longer work hours. Small business owners are paying themselves a lot less than they would likely make in most other scenarios. Small business owners obviously sacrifice a lot to run their business, but do they regret it? Absolutely not. In fact, 92% of respondents said they don’t regret starting their business. Business owners know what they’ve signed up for. It’s a lot of work with a lot of rewards. And, they’re not the only ones that benefit. Their contributions to local communities and the larger economy are unparalleled. Small businesses created 64% of net new jobs in the U.S. between 1993 and 2011—they’re America’s job creators for a reason. The personality, charm, and service they bring to our neighborhoods shouldn’t go unnoticed. Make sure to remember that next time you’re visiting your favorite small business. 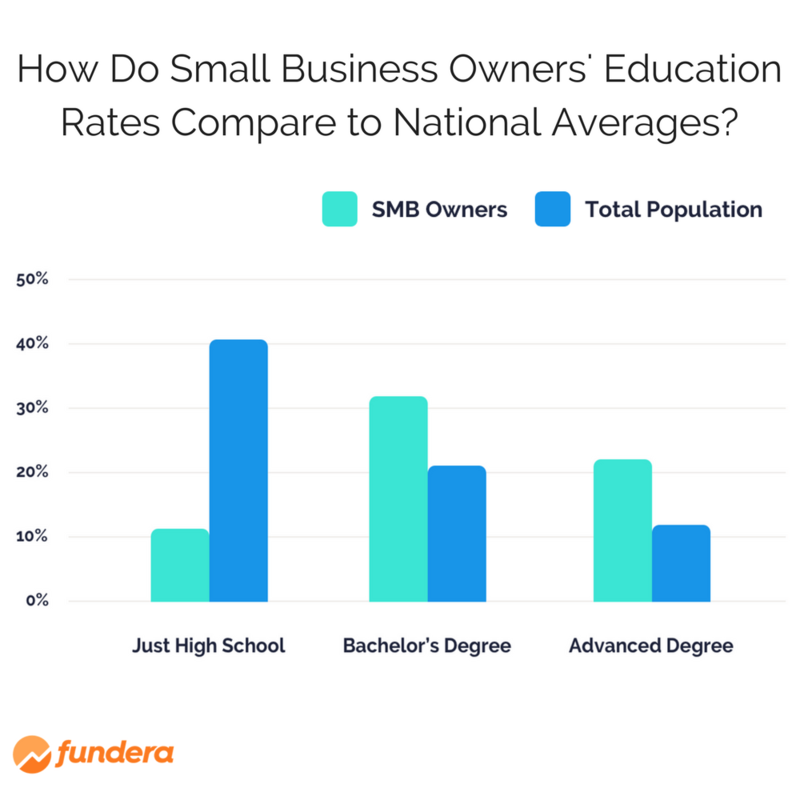 Fundera and Qualtrics conducted a random survey of 409 small business owners and senior leadership at small businesses. The survey was conducted online between May 24 and May 26, 2017. 389 respondents self-identified as a “small business owner,” while 20 respondents identified as a “VP-level or above at a small business.” Small business was defined as a US-based firm with less than 500 employees.